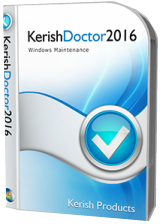 Kerish Doctor 2016 is an integrated solution for computer maintenance, which utilizes the most promising developments in this area. Due to its unique system, Kerish Doctor 2016 prevents Windows crashes in real time and it also safely fixes registry errors. The application regularly performs the most thorough and safe cleaning of your system to eliminate accumulated digital “trash”, and it increases the efficiency of your computer in the most optimal way possible. Kerish Doctor 2016 protects your PC from malware and potential vulnerabilities, and it monitors computer settings that are important from the point of view of security. The Smart Update system promptly updates the application’s databases that are constantly being improved by our experts. Thanks to this system, the software suite is able to become more effective every day. Please note: The program provides a 1-Year license.